Kit-Kat Sandwiches! Japan Has Kit-Kat Sandwiches. From the country with the most interesting Kit-Kat flavors, comes this: a Kit-Kat sandwich you can order at a fast food chain. Sure, why not? Though, I bet somewhere someone in a moment of snacking depravity has put Kit-Kats between bread. However, no fastfood chain has ever sold such madness to the masses. Until now. 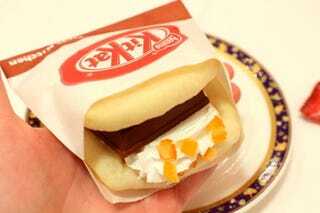 Fast food chain First Kitchen is rolling out the Kit-Kat sandwich in Japan. According to website Gigazine, this sweet treat is a Kit-Kat that's topped with whipped cream and orange peel and stuffed between two slices of white bread. Website Entabe took a photo of the sandwich on a fancy plate. Thanks, Entabe! This isn't your typical Kit-Kat bar, but rather, "Kit-Kat for Cafe," which is specially designed for dipping in hot beverages. This makes the Kit-Kat sandwich crispier than a regular Kit-Kat bar would. On Twitter, people are saying the sandwich "tastes better than expected." Available for a limited time only, it's priced at 220 yen (US$1.81) per sandwich. Chocolate. Whipped cream. Orange peel. Bread. What's not not like? Maybe the bread part. But I might give it a whirl. I might not! WHO KNOWS. I do, that's who.